Spring's most definitely sprung, and that means it's open season on your dreams and plans for next year! Yep, it's that time of year again when we unleash the tickets and you & your crew come together to pull the trigger on project registrations and grant applications. Painting that vast blank canvas with wild splashes of creativity might still seem far off yet, and it can be a daunting challenge, but hell, you've got the moxy and the tools. Crack on. For those of you unable to afford a full price ticket, remember you have options and are always able to apply for a Subsidised ticket, which requires a motivation. And don't forget: Community tickets are set up to acknowledge the reality in South Africa that many economically disadvantaged people would never be able to partake in AfrikaBurn if they had to pay for any other ticket. This way, we're doing what we can by making as many options available as possible to ensure Tankwa Town is inclusive. Of course, there's always the Big Question: when do General Sales start? That would be on November 4th, 12 midday. 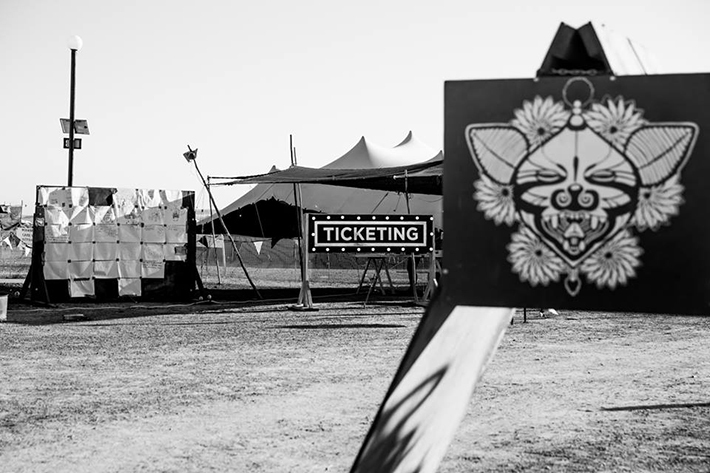 In line with our release of 2017's general ticket info - and those all-important project registrations - our team has also started notifying longstanding contributors from Artwork, Theme Camp, Mutant Vehicle and Performance crews to be on the lookout for mails containing instructions on the allocation of Direct Distribution Tickets. So, if you're on a project crew, start scanning your mailbox - and if you hadn't heard anything yet, give your project lead a poke and remind them to check with the relevant Wranglers to find out about your crew's allocation. To everyone that's planning for next year already, thank you! We fokken love you for doing the thing you do to make every year a conflagration of wild imaginationing. Is that even a word? Hell, it is now. Need advice on your project? Just get in touch with our team and they'll assist with sage words on technical, logistical or even philosophical aspects. Did we mention that Creative Grants, and Mutant Vehicle Grants, are open? True's bob: they're out there, waiting for you to start hacking away at your keyboard. Don't forget - out here in the defaulty world, deadlines are a reality and they come at you as swift as a... well, as swift as a Baardskeerder trying to get out of the sun, in fact. Looking for funding for your project? Make sharp and don't forget - you need to register a project first, before you can lodge a Grant application. Need info on Grants? That's all here. We're doing it again - taking our desert experiment to the streets of Observatory in Cape Town so we can fill them with a wild mix of colour, sound and good vibes. Think of the day as just a smaller version of the blank canvas that Tankwa Town offers us all every year - it's your space, where you can make anything happen. 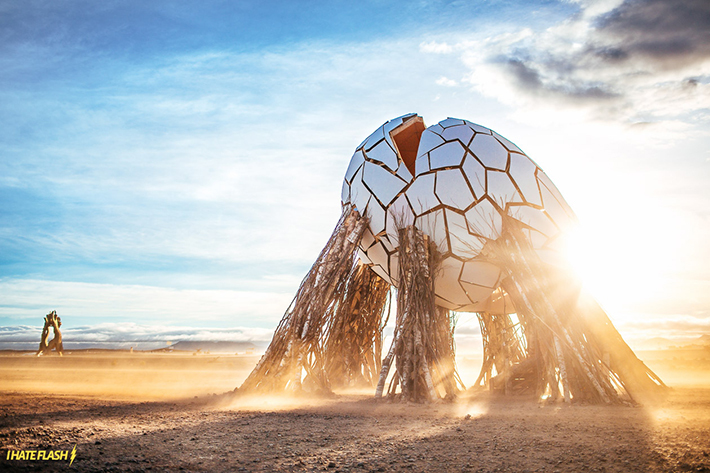 As with last year, there'll be AfrikaBurn artworks and Mutant Vehicles on display, as well as creative contributions from the residents of Obs - and hopefully from you right there. If last year was anything to go by, we're in for a spontaneous carnival of activities - and of course, it's all absolutely positively 100% gratis and mahala - and everyone's invited. What, where & when? 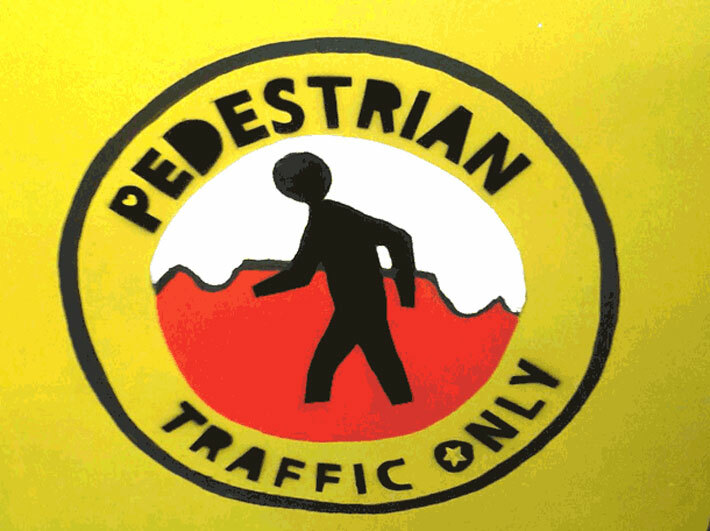 It all happens from 10am - 7pm on the Village Green and along Lower Main Rd in Obs, Cape Town, on Saturday November 26th! Hell yes, take me to the Streetopia site! Our Art Wranglers are looking for you right there to bring your pieces to Streetopia on November 26th. If you've got an existing piece - or if you'd like to create a new one - head to the Participate page on Streetopia's website, fill out the form, and our dearly beloved Wranglers will get back to you with info on where your piece could be installed for all to enjoy on the day. As you might know, everything we do is only possible because of volunteers - and ahead of Streetopia we have a range of activities set up to prep all the things needed for the day. The next one up is another signage day at our workyard, with some bench making thrown in for good measure. 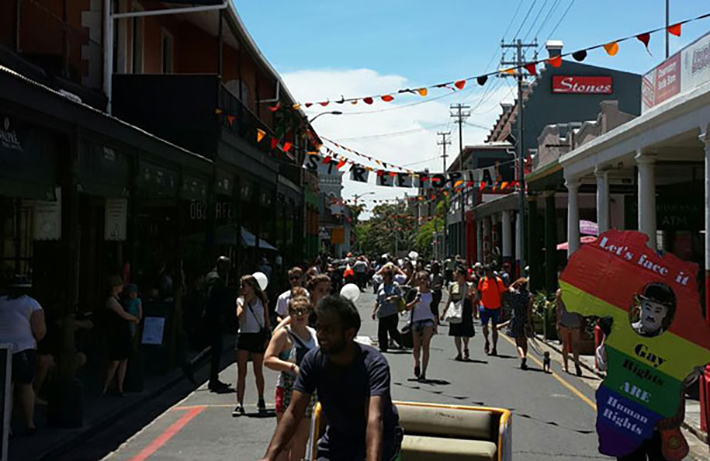 If you're in the area and are up for picthing in and helping make some of the stuff needed for our day in the streets of Obs, come on over and get stuck in. Massive thanks to everyone who pitched in at our last session! Ahead of this year's event, a crew made their way down from KZN with a kakload of black wattle, and started building a sublime monument to the |Xam, the original inhabitants of the Tankwa Karoo. It awed all who saw it and climbed its stairs to gaze out over the baking plains. It's the Temple |Xam, which was built by artist Kim Goodwin and his crew of The Dandylions - and it's still out there, awaiting your return. 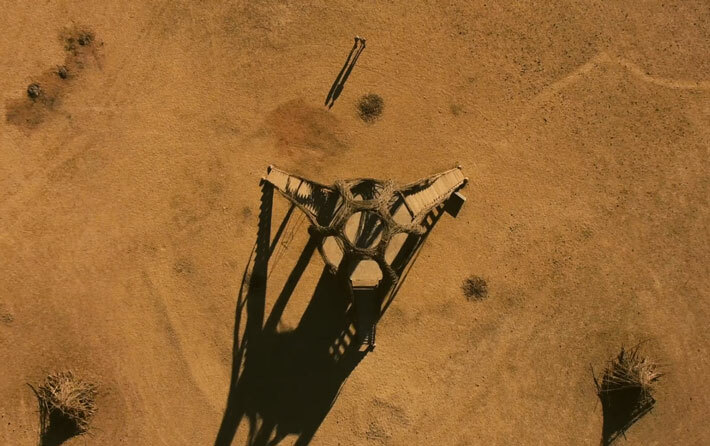 Until then, if you'd like to know more about it and the process of building it, and the thought that went into the structure, filmmaker Louis Bolton's superb documentary 'Building Temple |Xam' will be screened on the community station Cape Town TV soon. If your'e in the Cape Town area, you can pick up CTV for free - head here for info on how to turn on & tune in on your box. If you're not in Cape Town, you can catch it on Channel 263 on DsTV. Well done to everyone involved in building and capturing this amazing artpiece! Our crack team of techies are hostiong our very first hackathon! 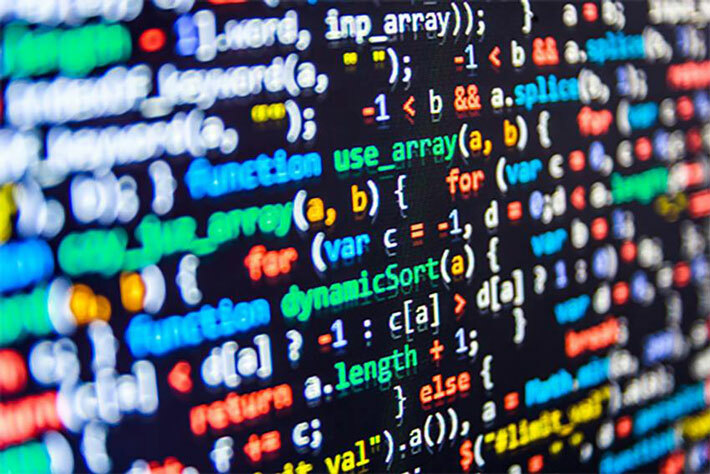 They're going to be looking at the new development environment for our site, tinker with Drupal, meet some skilled CSS wizards and maybe create some new templates and discuss new tech projects set for launch soon. Oh - and there will be pizza. If that sounds like something that's right up your alley, come along and hack away at keyboards this weekend! Need info? Head here for the Facebook event page. The dazzling dames over at the Saloon are at it again! Dust off your boots, slip into your steampunk best, and help them raise pulses - and funding - for their 2017 saloon. As always, there'll be beats to move your feets thanks to the killer tunes of the saloon's regulars. If you're in the the KZN area over the start of November, you could do worse than head down to the Precombustion affair happening in Durban. It's shaping up to be a fine showing by our community in the area, with a great and diverse range of activities happening on the day from fire art to market stalls, performance and film screenings all in the mix. Tickets: R50 (early birds), R70 (presales), R90 on the door. Kids under 12 are free, kids between 12 and 18 half price. Check out the event page for the full lineup and range of activities. Reading's good. It exercises your eyeballs. If your balls need exercising, read this.